Talk about Wahab Riaz and World Cup, a fiery spell of his against Shane Watson comes to the mind. In the last edition of the ODI World Cup, he had bowled a terrific spell to Watson which left the Australian bamboozled. Unfortunately, the Pakistani pacer couldn’t bring his side home and the Aussies went on to win their 5th world title. The left-arm pacer is not in Pakistan’s scheme of things now in ODI cricket. But just like all the teams, Pakistan also has the prestigious World Cup 2019 in mind. The tournament will be hosted by England and Wales, the same venue where Pakistan had won the last ICC event. 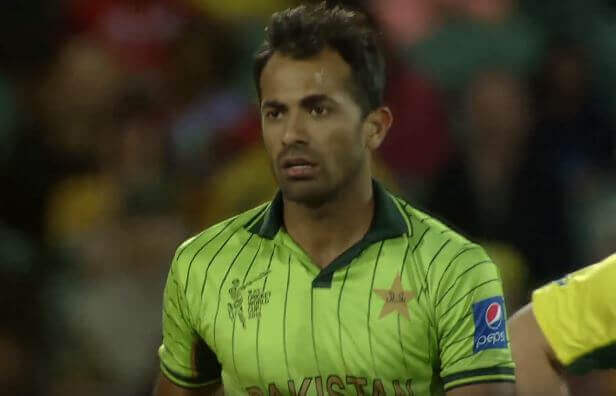 Wahab Riaz believes that his country will have a great chance to win their second world title. But for that, the squad will have to bring their A game. “We can definitely repeat the 2017 Champions Trophy-winning performance in the World Cup next year. For that, we have to put in a lot of hard work. We have to play our best game. ODI cricket is more of a momentum game. We have a good side and we can do really good in England,” Riaz was quoted as saying by India Today. The Men in Green had won the ICC Champions Trophy 2017 by defeating the arch-rivals India in the final. Once again, the two neighbors will clash in the World Cup 2019. India’s chances rest heavily on the skipper Virat Kohli but Wahab Riaz feels that it’s not only about him and Pakistan will have plans against the whole team. “Pakistan will have a plan against Virat for sure, but if they play against India in the World Cup then they would not only plan against Virat but they will have to think about the whole team. It’s not just about Kohli in the Indian team,” added Riaz.